The enriched yeast dough is a snap to make and even easier to shape into decadent, delicious cinnamon rolls. Nick Malgieri, the director of baking and pastry programs at The Institute of Culinary Education in New York City, created this recipe exclusively for Epicurious. The enriched yeast dough is a snap to make and even easier to shape into decadent, delicious cinnamon rolls. 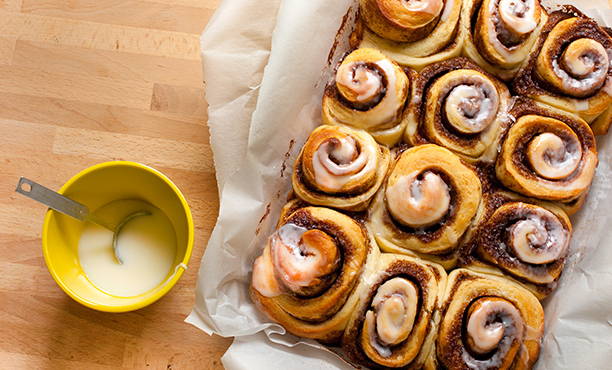 Best of all, the rolls can be baked ahead and reheated for a fresh-from-the-oven breakfast treat. In a heavy, small saucepan over moderate heat, warm the milk until it almost reaches a boil. Remove the pan from the heat and let the milk cool to lukewarm (about 100°F). In the bowl of a stand mixer, whisk together the lukewarm milk and yeast. Wait 30 seconds, then whisk again. Add the sugar and eggs and whisk to combine. Add the flour and salt and use a rubber spatula to stir together. Scrape the bowl to make sure there is no unabsorbed flour clinging to the sides or at the bottom of the bowl. Distribute the butter pieces on the surface of the dough, then place the bowl on the mixer and attach the dough hook. Lightly flour a work surface and scrape the dough out of the bowl. Lightly flour the dough then gently press and pull it into a 12- by 18-inch rectangle. Dot the cinnamon butter all over the surface, then use a knife or small offset spatula to evenly spread it over the entire surface of the dough. Cool the rolls in the pan on a rack for 10 minutes. Using the parchment paper or foil overhang, lift the rolls out of the pan and transfer to a work surface. DO AHEAD: Cinnamon rolls can be baked, cooled, and stored in an airtight container, up to 2 days. Warm the cinnamon rolls in a 350°F oven for about 10 minutes then ice them as described below. Cinnamon rolls can also be frozen: Once cool, return the cinnamon rolls, still on the parchment or foil, to the pan, wrap the pan in a double layer of foil, and freeze up to 2 weeks. Defrost the rolls then warm them in a 350°F oven for about 10 minutes, ice, and serve.